Carrie Swim, presses into the breaking and growing pains of humanity. She continually tests the borders of paint and her own skill, thought, movement, and connection to the source. Her creative process serves as tools for healing and understanding the world within and around her. 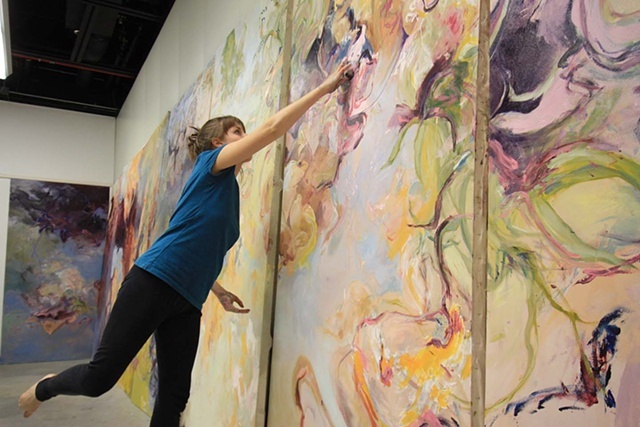 She carries a well-trained hand for representational work, yet dives into organic lyrical abstraction. Details of the subject observed are hidden yet known in line and color free from assumed definitions. She finds color to be a door into exploring the meaning behind a form, experience or idea untethered to associations specific forms can carry. Line carries a rhythm, a heart beat, of a form instead of a edge or singular thought. Her work includes, drawings, mixed media works, and large oil paintings some of which began by her unique body painting practice. She recently explores collaborations with visual, performance, and vocal artist, as well as installation work. He continually walks to corners of the earth as an ambassador for the healing art can bring. She recently finished artistic endeavors in Israel and Africa. She currently creates in her sunlit studio in Queens, New York.